o hear Palo Alto resident Keith Henson tell it, the real "problem" with the law isn't figuring out how to comply with it or even get around it, but convincing others that laws just don't matter. "Hilarious... obviously bogus," he said of U.S. copyright laws and efforts to enforce them. But when a federal court jury in San Jose patiently sat through both sides of the story, they unanimously disagreed with Henson and what he stands for  and in very strong terms. 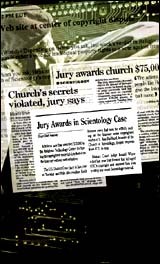 On May 12, 1998, the jurors concluded after a four-day trial that he had willfully infringed a copyright in an unpublished Scientology religious work and ordered he pay $75,000 in damages. That judgment may be the largest verdict ever handed down for an infringement of a single work. "We felt we needed to send a message to [Henson] and others like him, to prevent this kind of conduct from happening in the future," said one of the jurors when questioned following the verdict. Keith Henson in police custody after an arrest in Los Angeles. During another arrest, Henson savagely bit the person attempting to enforce a restraining order. His former wife charged him with molesting his own daughter. Attorneys for Religious Technology Center, plaintiff in the Henson case, stressed the importance of that message both in cyberspace and the creative community. "The decision sends another clear signal to those who think that laws and property rights are suspended on the Internet," said attorney Helena Kobrin. "The federal courts and the law-abiding citizens who serve on juries will not permit a lawless clique to gut the creative rights of authors and artists through copyright infringement." RTC holds the exclusive rights to certain unpublished works of L. Ron Hubbard, founder of the Scientology religion. The verdict followed a ruling last year by U.S. District Judge Ronald M. Whyte which found Henson had infringed RTC's copyright interests and awarded RTC a permanent injunction, forever prohibiting further violations by Henson. Prior to filing the suit, RTC warned Henson that he was acting in violation of federal law, and that he should desist from further infringement of RTC's rights. When he rejected the warning and repeated his infringement, RTC had no choice but to sue in order to protect and enforce its rights. "When your copyrights are under assault from infringers, and all other efforts to resolve the situation are to no avail, you must go to court to protect your rights," said Kobrin. Kobrin also stressed the importance of the decision for the Internet as a whole. "Freedom of speech cannot mean freedom to steal, to profit from theft or injure others," she said. "That kind of conduct can only give the Internet a bad name and hurt those who want to use it to improve their lives and help others. The greatest peril to the promise of the Internet is people who seek to turn it into a lawless frontier. This judgment should help keep the Internet safer for all."